Free breakfast an outdoor pool and well-equipped rooms make the Americas Best Value Inn - Tunica Resort a good deal for our guests who want to save some cash for the nearby casinos and shopping. The two-story Americas Best Value Inn offers 100 rooms with coffeemakers microwaves and mini-fridges; non-smoking rooms can be requested and Wi-Fi is free in public spaces. Enjoy a complimentary continental breakfast on weekdays and a hot breakfast on weekends while taking in the views from the glass-enclosed atrium lobby. The seasonal outdoor pool is open Memorial Day through Labor Day and is ringed with lounge chairs perfect for soaking in the sun and catching up on some reading. The hotel also offers a business center meeting space and a guest laundry for your convenience. Pets are permitted. 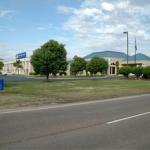 The hotel is located off Highway 61 one mile from the outlet bargains at Casino Factory Shoppes. Guests can try their luck at one of the five casinos within 10 minutes of the hotel. There are several dining options within five minutes of the hotel. Tunica River Park is three miles away. Golfers can take on River Bend Links 10 minutes away. The attractions of Memphis including Beale Street Graceland and the Memphis Zoo are 40 minutes from the hotel. It's 14 miles from Tunica Airport and 30 miles from Memphis International Airport.